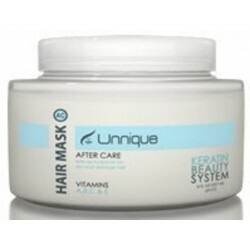 Unnique After Care Hair Mask 16oz (Intense Hydration for Dry and Damaged Hair) - Just Beauty Products, Inc. The Unnique Keratin Beauty System Hair Mask is Developed to remove frizz, hydrate, and keep the results of keratin treatments and straightening procedures. Penetrates deep into the hair to restore elasticity and rebuild strength while repairing the damage caused by chemicals and other environmental stresses. Unnique KBS After Care Mask: For fine, brittle, and damaged hair, the Argan Oil Restorative Hair Mask is a powerful product that rebuilds, repairs, moisturizes, and provides a brilliant shine. Unnique KBS Hair Mask penetrates deep into the hair to restore elasticity and rebuild strength while repairing the damage caused by chemicals and other environmental stresses. This unique formula is rich in proteins and will help bring back your hair’s natural health leaving it moisturized and shiny. The Unnique Keratin Beauty System Hair Mask is Developed to remove frizz, hydrate, and keep the results of keratin treatments and straightening procedures. How to use: Apply after shampooing and let penetrate for 7-10 minutes, then rinse and follow with unnique Moroccan Oil styling product. Unnique KBS Hair Mask contains Argan Oil which restores and protects your hair. Reverses environmental damage (wind & sunlight). Penetrates deeply for deep healing. Leaves hair shiny and moisturized. Keep the results of keratin treatments and straightening procedures.